With two additional blockbuster movies on deck, to go along with “The Expendables 3” and “Fast and Furious 6” that have already been filmed, it seems like only a matter of time before UFC bantamweight champion Ronda Rousey (pictured) puts MMA in her rear-view mirror as she drives off into the Hollywood sunset. While swapping rigorous training sessions and risk of serious injury for the hopes of big screen superstardom, and presumably much bigger paydays, would be a no-brainer for most, Rousey simply wants to do what makes her happy. 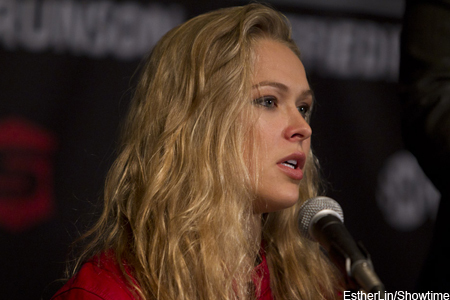 The UFC admittedly cracked the whip on Rousey after signing the former Strikeforce star in November 2012. She single-handedly promoted her big league debut at UFC 157, then was tossed immediately into filming “The Ultimate Fighter 18” against bitter rival Miesha Tate. TUF proved to be a disastrous experience for Rousey, as her image among MMA fans took a nosedive during the reality show. What would appear to be a chaotic schedule for many is just what the doctor ordered, as far as Rousey is concerned. “Rowdy” claims she’s perfectly happy juggling both careers. In fact, she says it’s what she needs in order to keep things fresh. Rousey defends her throne February 22 at UFC 170 against Sara McMann. She’ll immediately jump into filming “Entourage” in mid-March.